Contest organizers are free to change the appearance of the problem solving page and prevent the display of individual tabs. The descriptions in this section are based on standard page structure. Viewing the conditions of a submission and submitting a solution can be done on the Problems tab. Use the Submission type switch to choose the method of submission. For each problem, the method for submitting the solution method is only selected once. If submitted in blind mode, the solution will pass the intermediate set of tests, after which it is impossible to change and resubmit it. The switch is displayed only for contests whose rules stipulate submitting solutions using various methods. In the Language field, select from the list the name of the programming language in which the problem solution is written. Set the solution submission method switch in the desired position and select the file with the solution or just type the solution. Do not submit a compiled solution. Click Submit. The solution will be submitted to a test server to be judged. The solution is judged by system tests that are the same for all participants. Judging is done automatically, so when you solve problems, follow the format of the input and output files exactly as described in the conditions for each problem. The result is shown in the table at the bottom of the tab. The solution is considered correct if the solution passes all system or intermediate tests and time and memory usage limits are not exceeded. If the solution did not pass judging, then the detected error type message will be displayed in the table. You can see the list of all submitted solutions on the Submissions tab. 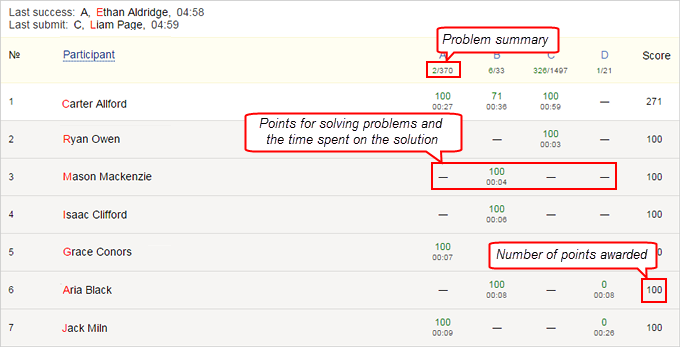 You can correct incorrect solutions and submit them for judging again (in this case the time penalty may be increased). Results for all submitted solutions are displayed in a table on the Submissions tab. Submission time Date and time when the solution was submitted. ID Solution ID number. Use it if you want to ask a question about this solution. Problem Letter of the problem in the problem list. Compiler The compiler that was used to test the solution. Verdict The result of a solution on the testing server: Solution Is Correct, or Error Was Detected. Submission type Method of submitting the problem: Open or Blind. This is specified if it is stipulated by the contest rules. Time Solution performance time (ms). Memory Volume of memory used to solve the problem (in bytes). Test Number of test containing an error. This is not determined for all detected errors (see details in Error Types). 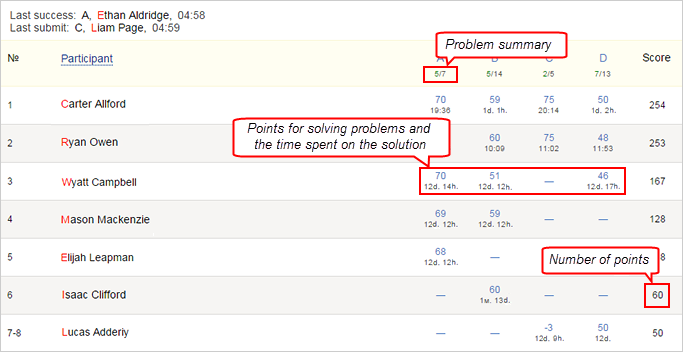 Score The number of points scored for solving the problem. This is specified if it is stipulated by the contest rules. View report Link to view judging details (source code of the solution, how it differs from the previous version and compilation log). On this tab you can submit the solution to the problem for testing. Select the required problem from the Problems list and enter its solution. Note. There may not be a jury for trial virtual contests and post-contest solving. In such contests the real winner is not declared, the position of the participants in the standings is determined only by the results of automated judging of solutions. If you have any questions about problems or about the contest in general, ask it on the Messages tab. In addition to responses to your private messages, the jury can send general announcements. These messages are used to change the conditions of problems or to provide other important information to all participants. General announcements are displayed in the upper right corner of the page like this: . If your question relates directly to the functionality of the Yandex.Contest platform, then you can contact the support team using the feedback form. The standings display the current results of all the contest participants, except for the results of participants that are taking part in the contest for training purposes. To view the table, please go to the Standings tab. 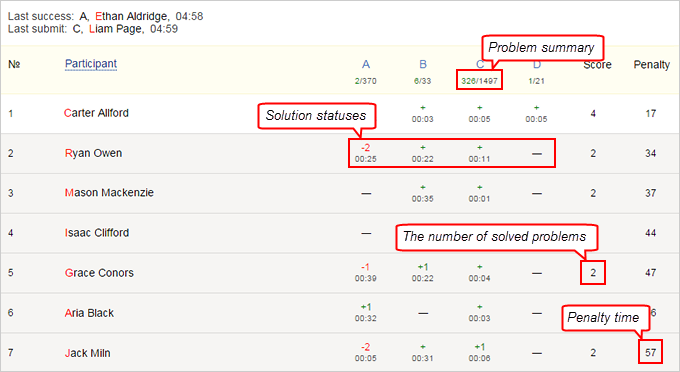 Column headings indicate the grand total for participants for each problem (the number of correct solutions/number of attempts). — problem solution was not submitted. — the problem was solved. — the problem was not solved or it was solved partially (for example, the solution passed system tests, but the runtime limit was exceeded). 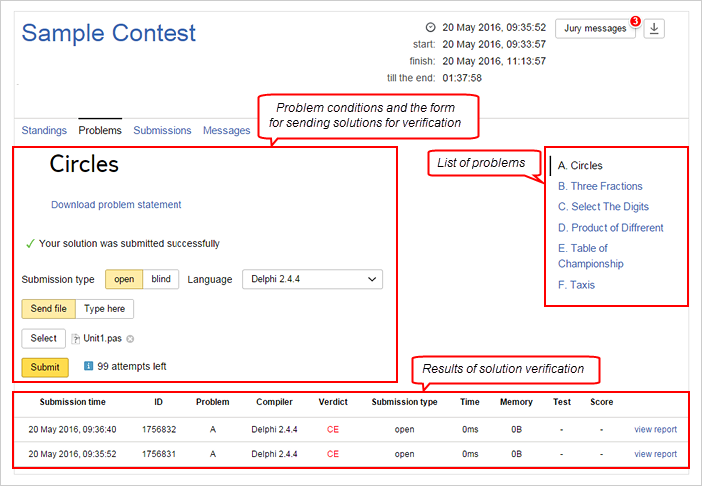 The number of unsuccessful attempts to solve the problem is shown to the right of the status; the time that elapsed from the start of the contest to the time when the correct solution was submitted is indicated under the status. The number of solved problems. The number of points scored for solving the problem. The time that elapsed from the start of the contest to the time when the correct solution was submitted is indicated under the scores. The symbol means that solutions to the problem were not submitted for judging. 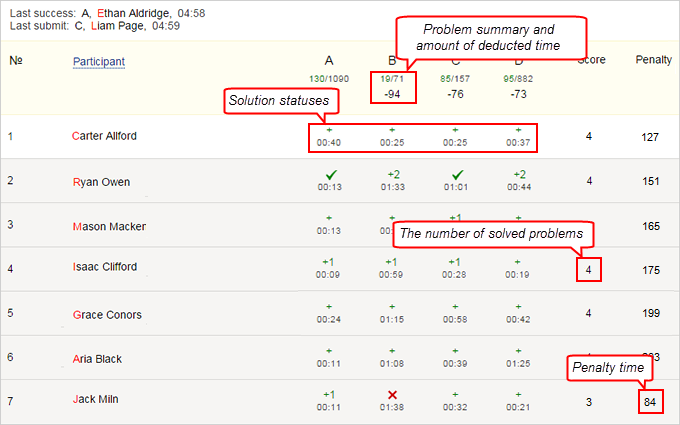 Column headings indicate the grand total for participants for each problem (the number of solutions/number of attempts) and subtracted penalty time for the correct solution to this problem in blind mode. — the problem was solved in open mode. — the problem was not solved or was partially solved in open mode (for example, the solution passed system tests but runtime limit was exceeded). — the problem was solved in blind mode. — the problem was not solved in blind mode.